Lee Tergesen ("Oz's" Beecher!) runs through the woods, chased by the Criminal Minds team. He's caught easily. So easily, in fact, that I begin to wonder if this episode is going to take place in flashback. I also suspect that no one told the camera crew that if they simply turned the camera around 180 degrees it might hide the fact that this chase is happening in the LA hills, as opposed to the small New York state town where it's set. There are no flashbacks in the offing, though - Lee's being arrested for kidnapping his daughter and killing a woman (not the mother, though). Seems like this would be the end of the line for him, but he's rescued when another car crashes into the sedan taking him into custody! When freed by his accomplice Lee murders the driver (A Martinez!) but leaves Prentiss alive, largely because she's in the cast, and this is an American TV show. Big question 1 for the episode - why was the car all alone on the road? Don't major operations like this generally move in convoys? What's Lee up to, and who's he working with? We'll find out after the opening credits! With Lee on the run with a sidekick, their profile of the situation has changed - he was just a thief who recently got out of prison. Why kill a woman? Why kidnap his child and then hide out somewhere very easy to find? Why were they working on this case at all? There's a scene with Lee and the sidekick, who's clearly pissed to be working with the killer. So he's either indebted to him somehow, or being forced. The team continues trying to figure out why he murdered the woman earlier - she was a junkie whose only connection to Lee was that her brother did time with him upstate. The brother's dead, though, so the connection seems tenuous. Garcia has a line on Lee's motive for sticking around after the kidnapping - most of the money from his robbery was never recovered! Maybe he needs to get it back from a partner? The team also considers a possible revenge motivation - did someone turn Lee in? They elect to look into the circumstances of his arrest for the 15 robberies. Which really seems like something they should have been doing much earlier. Didn't Garcia fully explore this guy's backstory when they started hunting him more than a day ago - why does this all seem like new information? Garcia finds a lead by checking other bank robbers who got plea agreements - one of them made a deal just around the time Lee was arrested. It's nice that they're trying to surmise and extrapolate here, but shouldn't all of this be in the official record? Wouldn't the DA and arresting officers have told them about it? Now it's over to Lee, who's brought his sidekick along to help kill the rat in question! We now learn that the sidekick is definitely being blackmailed, since Lee offers a gun so the sidekick can shoot Lee, but the sidekick defers. So the sidekick hates him, but can't murder him - why? Once the team arrives, they discover that the sidekick is an okay fellow who made sure that the rat's family wasn't hurt while Lee was murdering him. In fact, back at the hideout the sidekick beats Lee up a little before realizing that he can't go through with it. Lee pushes it farther, essentially daring the sidekick to shoot him in the head to prevent any further deaths. Since the sidekick doesn't do it, the only possible explanation is that his family has been abducted, and only Lee knows where they are. So let's go with that. Although it creates all sorts of plot problems, which we'll get into later on. Hoping to get some information about the sidekick, Derek interviews Emily about the events just before and after the accident. She remembers the sidekick trying to help her out, as well as freaking out about the dead cop - adding that to helping the family, and they figure the guy is a good person who must be being extorted into helping out. Naturally, they also jump to the 'kidnapped family' conclusion. They search the case files thoroughly, and find someone who was supposed to testify in the trial, but didn't. Since the guy's file is weirdly empty for a low-class criminal, he must have been an undercover police officer! Searching state records for that year, Prentiss recognizes the cop, and the quickly learn that his family is missing. Assuming that the cop would only still be alive if Lee needed him for something, the team extrapolates that Lee must have hidden his money in a safety deposit box, and that since his face is too well-known to allow him to walk into a bank, he'll need the cop to do it for him! Yeah, things just got real stupid. Lee was in jail for a dozen years. Who was paying for the safety deposit box all that time? It's not like he could mail in a cheque, and he supposedly didn't have any associates to do it for him - really, who would you trust with the location of your stash? 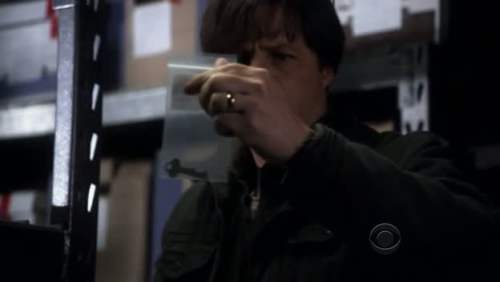 It's even dumber than that, however - Lee needed the cop to go into an evidence lockup and get the key that was taken from him when he was arrested all those years ago. Yeah, wrap your head around that one - a bank robber was arrested, and most of the money he'd stolen hadn't been found. On him was a safety deposit box key for a bank in the town where he lived. Somehow none of this was considered worth looking into by the cops at the time. The team rushes down to the police evidence lockup, hoping to find some clue as to the location of the money, but they run into Lee in the parking lot instead, and shoot him dead. Which leaves them with the sidekick, who's a little pissed that his family is probably going to die now. Of course they're not, though - finding them is a simple matter of looking at the one piece of evidence that doesn't fit: the dead woman. Assuming that Lee moved her body from the alley where he stabbed her because it was somehow important, the team heads down to the abandoned tenements and looks around. It takes them roughly five minutes to find the family. Is examining evidence profiling? No? Then no. I suppose they'll get partial credit for understanding the importance of moving a body, although that's being hugely generous. 2/10 - Here are some questions never explained by the show - why weren't a guy who testified against Lee and an undercover cop who worked on his case informed when he was released from prison? How did Lee find out who the undercover cop was, and where he lived? Most importantly, why would a trained police officer believe for a second that, when given a choice between trusting a brutal murderer and employing essentially every resource of the state of New York and the FBI in finding his family that he'd go with the first option rather than the second? The absolute moment that the cops caught Lee Tergesen, why didn't the sidekick just come walking out of the woods an announce 'Hey, I'm a cop whose family this guy kidnapped - be sure to get their location from him, okay? Also, here's everything I know.' When the other option is 'run through the woods, steal a truck, hope there's an opportunity to run the cop car carrying Lee off the road, and pray that he's not fatally injured in the crash', why would you choose it? Also, one more time, the cops didn't bother looking into the safety deposit box key that the famed bank robber had on him when he was arrested. Can someone please explain to me who took the youngest child from his mom in the drug den and why, when the team showed up, was he only wearing underwear? Obviously someone had him seperated and naked and I wanna know why that guy wasn't shown being arrested! And did the writers really even have to add in that little detail at all?